The living room is a 150m2 loft with a double king size bed, home cinema, stereo system, wifi, dining space, shower room, kitchen, air conditioning, living with office space and some of Pascal Morabito's personal art collection. All open on a 100m2 terrace overlooking Bingin's famous waves. Amazing and independent suite, located on the same level than the living area, offers a complete view on the Indian Ocean. 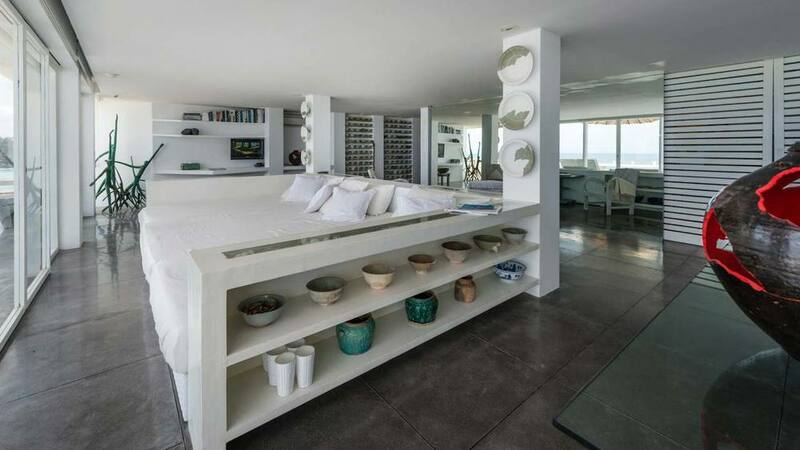 The suite, entirely conceived and decorated by Pascal Morabito, bed, pieces of art, overlooks a terrace. One of the nicest suites in the world, it is a pure and masterly space with the infinity for horizon. The Master Bedroom is 40m2 and has 1 king size bed, Individual controlled air conditioning, shower room, Hair dryer, in room safety box and TV. Settled in middle of Bingin cliff there is 100 steps to reach the villa, then 80 steps to the beach. 1 Bedroom with controlled air conditioning (1 Living sofa/bed for children). 1 Butler and one House Keeper are available at your service. All accommodations offer an extensive range of amenities. Complementary Airport pick up for arrival & departure.